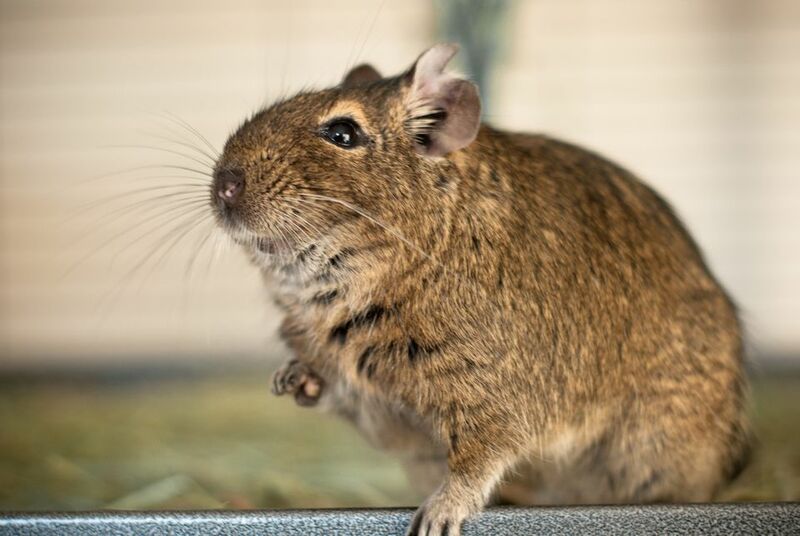 Cats and dogs often get diabetes, but did you know that degus (Octodon degus) are very susceptible to this insulin issue, too? There are two main kinds of diabetes, but degus (and most other animals who are susceptible to getting it) are diagnosed with diabetes mellitus. Diabetes mellitus occurs when the cells in the pancreas stop using the insulin the body produces or stop producing insulin altogether. This lack of insulin coming into the cells causes the blood sugar (glucose) to rise (which makes your degu hyperglycemic). A normal degu's body would naturally produce and absorb the insulin when his glucose levels rise, but in a diabetic degu, his body does not. No insulin gets absorbed, so the glucose levels rise and cause a degu with diabetes to become hyperglycemic. Degus, as well as dogs, cats, and people, can die from diabetes. It is not a disease to be taken lightly, and all the steps to help shield your degu from this disease should be taken. What Are the Symptoms of Diabetes in Degus? Just like in other pets, a diabetic degu will become polyuric (urinate a lot) and polydipsic (drink a lot of water). Cataracts usually develop within a few weeks of your degu getting diabetes, and the longer he has diabetes, the worse he will do. Diabetic degus will lose weight (after initially being very overweight), urinate a lot, drink a lot of water, won't be able to see from cataracts, and are more susceptible to infections if they get a little cut. How Can I Prevent Diabetes in My Degu? First, and most importantly, feed a lot of hay. Food (fruits and treats) that has any sugar in it (molasses, honey, etc.) is terrible to give to degus, even if they like it. Also, many degu pellets will have molasses in them, rendering them very unsafe for a pet degu who doesn't want diabetes. Their little bodies cannot control the glucose spikes these foods cause and, in return, become diabetic when their insulin receptors stop working. Be sure to read the ingredients on all labels and choose a sugar-free diet, such as Exotic Nutrition's Degu Complete. Many degus are also genetically predisposed to diabetes; therefore you may not be able to do much to prevent diabetes in your pet. You of course never want to do anything to make diabetes worse in your degu so regardless of whether or not your pet is genetically predisposed to it, don't feed sugary foods. If your degu is overweight, it would be good to get him to lose weight by increasing activity (get a wheel or ball for him to run in) and cutting out all treats. Pellets should also be limited to encourage weight loss but make sure your degu is always eating his timothy hay. If your degu ever stops eating, start syringe feeding a mixed vegetable baby food and get him to your exotics vet as soon as possible. Ileus is a life-threatening illness in all hindgut fermenters like degus and will develop if your degu stops eating. How is Diabetes in Degus Treated? As of now, there is no good treatment for diabetes in degus. Cats, dogs, and humans can take insulin injections to regulate their blood sugar, but we have not found that to work in degus. Degus are most likely insulin resistant, meaning even if you inject insulin into their little body, their body doesn't use it. Right now the best ways to "treat" diabetes are the same things you would do to prevent it. Don't allow your degu to get overweight or help him lose weight if he is overweight by increasing the amount of exercise he gets, don't feed treats or food with sugar in it (read the labels), make sure there is nothing in your degu's cage that would cause him to cut or scratch himself, and keep it extra clean. Diabetics have a difficult time healing from infections since high blood sugar levels weaken their immune systems. Simple urinary tract infections from sitting in dirty bedding, open wounds from a sharp cage corner, or bumblefoot (such as the kind rats get) can be incredibly hard to heal in diabetic degus. Frequently the systemic infection that results from the infected site spreading throughout the bloodstream is what kills the pet. Therefore, cleanliness and safety are high priorities for diabetics. If you suspect your degu has diabetes, get him checked out by your exotics vet. Even though he may tell you there is nothing he can do, you'll at least know how properly care for your little pet and keep him as comfortable as possible. One day we may have a treatment for diabetes in degus, but for now, prevention is the best thing you can do.